Spring is here in Lancaster County and Easter is coming! Spring means new GROWTH and we are excited to announce the opening of our expanded space and new vendors! The Lancaster Marketplace Stands have you covered for a variety of spring and Easter needs from gifts to making a delicious Easter dinner. The Lancaster Marketplace is excited to announce the opening of our expanded area adjacent to our current marketplace. The former liquor store area has been transformed into more vendor space for stands and the week of April 10 is the opening of 3 new stands soon to be followed by a 4th! In their own words, “We’re here for the family chef, the foodies, the health focused and the environmentally conscious! We’re here for the community builders and those concerned with animal welfare. We’re here for everyone that appreciates great meat and knows that is what brings people to the table. Easter Chocolates from Miesse Candies. Perhaps you need Easter gifts for the loved ones in your family. 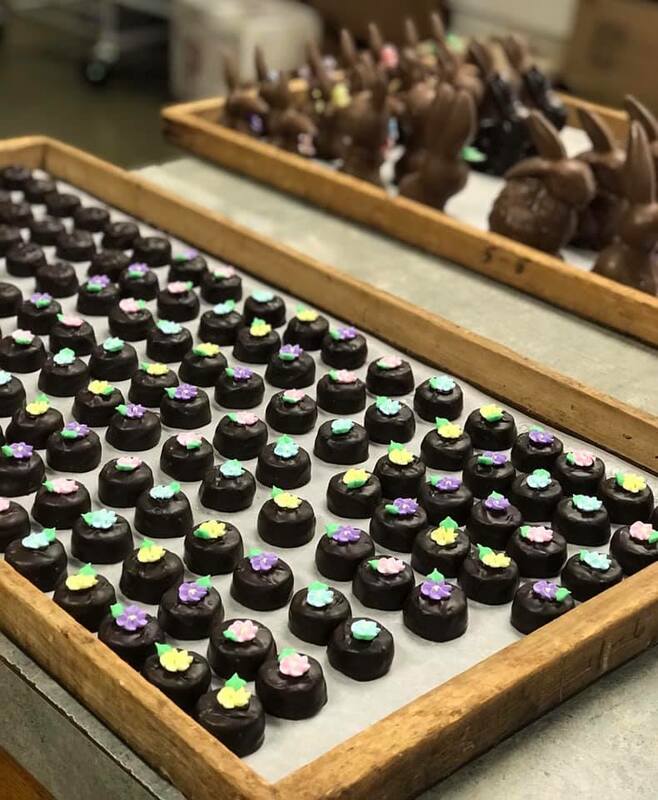 Lancaster Marketplace can help with everything from chocolate Easter bunnies from the Miesse Candies stand to European pastries at Tanya’s Pastries, and sampler tea gift packages from The Spice & Tea Exchange. Other ideas include a basket of fresh fruits from Harvest Lane Farm Market stand or Chocolate dipped Stroopies from The Lancaster Stroopie Company. Harvest Lane offers local grown, grass fed meat that can be the centerpiece of your meal! No one locally has better fresh lettuce as well. From oranges to apples and any types of berries, Harvest Lane can meet your fruit and fresh vegetable needs as well. Not just serving the best teas, but you can make that Harvest Lane ham (or any meat!) outstanding with special blends that add flavor, spice, and zest. Perhaps it’s the Tuscan Blend you should try or the Butcher’s Blend. Maybe the Crazy Chicken Spice Blend should be on the menu or one of the other specialties. Come in, smell, and discuss to get the right Easter Ham blend now! Flavors of Morocco and Flora’s can make some of their special dishes ahead for you to pickup Saturday. Contact Bushra at Flavors of Morocco for Tagine with melt-in-your-mouth chicken or lamb, delicately spiced couscous, savory organic soups, and delectable classics including Biryani, Karahi Chicken, Goat and Lamb, Samosas, Rasmalai, and Mango Lassi. Flora’s can offer you wonderful wonderful Latin fusion including rice and beans, Pernil (roast pork), and veggie-only options. From Chicken Tandoori to Empanada’s and more, the international cuisine options are spectacular at the Lancaster Marketplace. It’s all about clean products from Christina Maser. Offering all-natural and locally grown items, their salad dressings can add the right touch to Harvest Lane lettuce! There is Blueberry Basil Vinaigrette with Balsamic Vinegar, Gingered Pear Vinaigrette with cinnamon pear white wine vinegar, and more! Remember, they keep it real. Clean. Simple. 100% Natural. Pickle platters of Taco pickles, garlic pickles, fresh dill, and more, you can take your side dish options to the next level with these special pickles from Lancaster Pickle Company. Multiple size options available! Platters, Gift Baskets, and more available from Taylor Chip Co. (how about edible cookie dough for dessert! ), Stroopie Co., Tanya’s Pastries, and Lancaster Pickle Company. Lancaster Marketplace can be your one-stop for fresh, local, and high quality fruits, vegetables, meats, dishes, and desserts this Easter. Yes, there are multiple gluten free options, as well as dairy free, and vegan options from different stands. Add Lancaster Marketplace to your list of places to go for Easter meal and gift preparations. Your support helps local businesses and local farmers. Open 10 a.m. to 6 p.m. Wednesday through Saturday, it’s time to come in and see the new expansion and visit the new stands and your favorite stands. Find us with convenient Lancaster parking just off Route 30 on Fruitville Pike next to the Panera Bread. Have you visited the Lancaster marketplace lately?